There are approximately 50,000 Kellys and O'Kellys in Ireland today. It is the second commonest Irish surname, not far behind Murphy in numerical strength. This name presents a remarkable example of the extent to which the prefixes O and Mac, so widely dropped during the period of Gaelic submergence, have been resumed. In the year 1890 there were 1,242 births registers as Kelly (distributed all over the country), while only nine were registered as O'Kelly. Today the proportion has risen from one in 130 to approximately one in twenty. President of Ireland, Mr. Sean T. O'Kelly, was a case in point. There is a fairly widespread but quite erroneous belief that all persons of the name descend from members of the great O'Kelly sept of Ui Maine. The fact is that this surname came into being independently in at least seven widely separated places. Up to the thirteenth century the O'Kellys of Breagh (Co. Meath) were equal in importance to those of Ui Maine, but the impact of the Anglo-Norman invasion dispersed them. The Kellys of Ulster to-day are, no doubt, mostly of the O'Kelly of Cinel Eachrach sept (Counties Antrim and Derry); those of the midlands come probably from the O'Kellys, one of the seven septs of Leix who were still strong in their homeland in 1543, when they were specifically mentioned in an order relating to martial law in queen's County; the atrocious murder of Fergus O'Kelly of Leix by the Earl of Kildare later in the same century, and the subsequent transfer of O'Kelly estates to the Fitzgeralds makes a black page in the history of the latter family; north Connacht Kellys are more likely to be of the Templeboy (Co. Sligo) sept than of that of Ui Maine; while Dublin Kellys can either be from a north Wicklow family of the name, or migrants from any of the above septs. In each case the eponymous ancestor was called Ceallach, a personal name, from the genitive case of which we get O Ceallaigh, the Irish form of the surname. The Kelys of Kilkenny and Tipperary, however, are O Caollaidhe, not O Ceallaigh, some of whom retain the older form Kealy, which is Queally in Co. Waterford. Queally is also found as a synonym of O Cadhla, usually O'Kelly in English. Most Rev. Malachy Queally, who was among the most distinguished of the Archbishops of Tuam (1630-1645), was born in the diocese of Killaloe which includes a great part of Tipperary. O'Kelly of Ui Maine was, and is, outstanding among all these. There is an authentic pedigree of their chiefs from the earliest times until the present day, and O'Kelly of Gallagh is one of the few whose claim to the designation Chief of the Name is officially recognized: in popular parlance he is The O'Kelly. 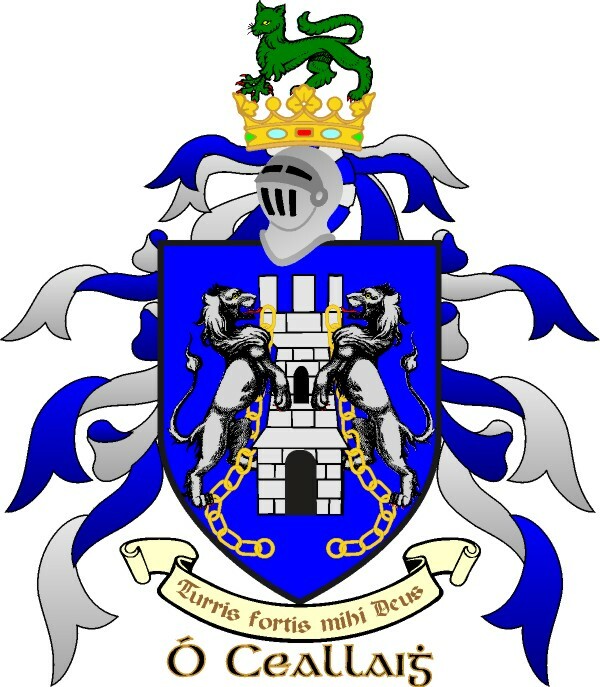 The arms illustrated in plate XVII are those of O'Kelly of Ui Maine and, it should be understood, do not appertain to O'Kellys of other septs. Ui Maine, often called Hy Many, covers east Co. Galway and the southern part of Co. Roscommon. The Four Masters and the other Annals are full of their exploits and obituaries. Four of them have been Bishops of Clonfert, which is the diocese comprising much of the O'Kelly country. In 1518 the O'Kellys were one of the dangerous Irish septs named by the Corporation of Galway. In the next century the O'Kellys of Co. Galway were very prominent, as indeed were those of the Pale, too, for no less than ten of the name in Counties Dublin, Kildare and Meath were attainted in 1642. The most famous was Col. Charles O'Reilly (1621-1695), who first appears in the 1641 war, as a commander under Sarsfield in 1690, and represented Co. Roscommon in the Parliament of 1689; he is best known, however, as the author of the very valuable contemporary history Excidium Macariae. It is of interest to note that the estate of this leading Catholic family was secured to them under the Treaty of Limerick. Twenty-five O'Kelly proprietors, nearly all of them of the HY Many sept, were attainted in 1691. In modern times they have been less prominent. Dennis O'Kelly (1720-1787) had a remarkable career: emigrating from Ireland he started as a billiard-marker in London, was part owner of the famous Derby winner "Eclipse", and became a colonel. Patrick O'Kelly (1754-1835) was a well-known character - poet and eccentric. James O'Kelly (1845-1916), had a varied and adventurous career as war correspondent in three continents and Parnellite M.P. Seamus O'Kelly (1881-1918), playwright, was another man of note hailing from east Galway. Many O'Kellys have distinguished themselves in America. Eugene Kelly (1808-1894), banker and philanthropist, a strong Irish nationalist and Catholic, and John Kelly, the missionary, were of the Derry-Tyrone sept. William Kely (1811-1888), the inventor, and, in a very different sphere, Michael Kelly (1857-1894), the idol of baseball fans, and also Co. Patrick Kelly, commander of the Irish Brigade at Gettysburg, may be mentioned. In France Father Malachy Kelly (d. 1684) was the founder of the Irish College, Paris. One branch of the Hy Many sept settled at Guyenne and was ranked among the nobility of France. It should be added that some Kellys are MacKelly, not O'Kelly. This was a minor sept also of east Connacht, but the Mac prefix is now entirely lost and any surviving modern representatives are thus indistinguishable from O'Kellys. Daniel MacKelly, Archbishop of Cashel from 1238-1253, was the first Dominican to become an Irish bishop. The well-known Kelly family fo the Isle of Man is also MacKelly. From information on O'Kelly pedigrees see O'Donovan, The Tribes and Customs of Hy Many, App. A.